Canadian gold coins are popular with investors because they have a high degree of liquidity. They are easy to sell if needed without any delays in the process. These coins offer the highest level of purity, and they are stamped with the gold 9999 purity level. Canadian gold coins are some of the most well known bullion coins in the world. These were the original 9999 quality coin and the purest coins available for a time, although there are others with the same purity now. The gold Maple Leaf price may seem like a small price to pay for some investors, like those who are looking for these coins because of the current economic situation around the globe. Canadian gold coins can be used by investors to help protect against any future inflation. Gold and silver have typically been held for this reason, and this is still true of most investors today. Gold bullion has reached record prices in the last year, and for many investors there is a belief that this metal will continue to rise in price. Canadian bullion coins can be used to take advantage of these record prices. There is a very high demand among investors and consumers alike for Canadian gold coins. This is due in part to Canada being right next door, so many investors are familiar with Canadian coins and currency. Portfolio diversity is important for loss protection, and Canadian gold bullion can play a role in this diversity. Some investors may also add gold Mexican coins and options from other foreign countries as well, to even out their portfolio. Canadian gold coins are considered a very safe and stable investment choice. The country is politically secure and well developed, so there are no wild market fluctuations or political considerations. 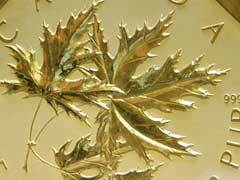 You can find gold Maple Leaf coins in a variety of weights and sizes. This means that no matter what the investment budget is, any investor can afford one of these coins.